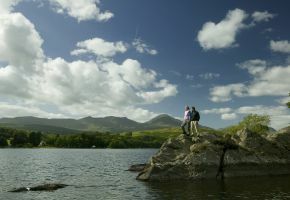 The Copper mining and slate quarrying town of Coniston sits between the Consiton Water and the Coniston Fells. There is plenty to do in the economy thriving town, including plenty of sightseeing, water-sports, mountaineering, horse riding and local pubs producing real ale! Huge Rock Chasms and spoil heaps litter the local Tiblberthwaite, where quarrying has cause a dramatic change in the local landscapes.